LEARN! and have all your steam locomotive questions answered by knowledgeable volunteers at the locomotive no.1673 ramada. 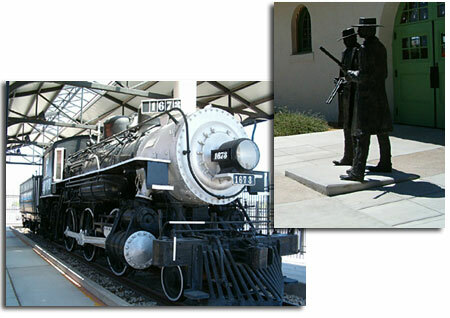 Explore transportation history in Southern Arizona through interactive museum exhibits! LISTEN and LOOK! at the modern day freight trains passing by! Ring the locomotive bell! Pick up an audio phone in the Museum to hear an exciting story of a railroad job or rest your feet in front of our beautiful photo media wall. CAPTURE! your photo with the “Doc” Holiday & Wyatt Earp life-size sculpture or relax on an original 1941 bench while taking in the beauty of the restored and still operating passenger lobby. SHOP! for that train fan in our unique gift shop!